LIVE ART IS HERE TO STAY. On July 18, 2012, Tate Modern launched the Tanks, a subterranean group of cylindrical chambers and other spaces that constitute the first phase in a dramatic expansion of the museum’s building by Herzog & de Meuron. Formerly the repository of a million gallons of oil, the Tanks are touted as the first museum galleries in the world permanently dedicated to live art, film, and installation. The Tanks’ current stage of programming—an elastic, fifteen-week series of exhibitions and events titled “Art in Action”—runs through October 28, at which time the galleries will temporarily close while construction resumes on the next phase of the museum’s expansion. Over the past twelve weeks, curators Stuart Comer, Catherine Wood, and Kathy Noble have invited dozens of artists to present new and old performances, installations, and film and multimedia works in the Tanks. As the first round of programming comes to a head, artforum.com spoke with Comer and Wood about how the Tanks are challenging old protocols and asserting new roles for the museum. 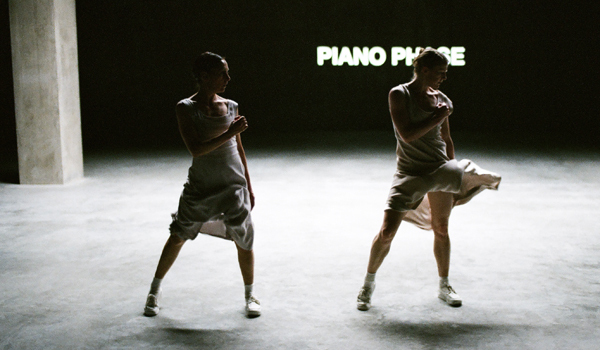 I DIDN’T FULLY REALIZE until Anne Teresa de Keersmaeker got into the Tate Tanks and started dancing how curious it had been to plan a whole festival of live art without being able to be in the spaces. Even up until a few weeks before they opened, it was a building site, and we were going down with hard hats and boots. We’d been entering via a temporary set of scaffolding steps too, which was disorientating scale-wise. I’d been worried that the spaces were too brutal. I just didn’t know how it would feel with bodies in there, in their vulnerable state, not armored in construction gear. But seeing Anne Teresa’s solo in the first week was a defining moment, because just one person doing something extraordinary totally held the space, and it suddenly felt like there really were great possibilities here. At first I think the dancers were a bit in shock, because the visitor flow here is quite intense. They had loads of people coming in and watching them warm up. It was less an attempt to make a feature of the process and more a question of what was being hidden: “Do we close the spaces off or not?” But the dancers started to relax and get into it, and then it became fascinating to watch, often funny, and more performative. Boris and Musée de la Danse had also invited Valda Setterfield, one of the most senior original Cunningham dancers, to come and speak to the audience while they rehearsed, which created an incredible parallel situation between their movements and her narrative description. On Saturday afternoon, he invited members of the audience to do the piece themselves, spontaneously, and ended up getting twenty-five people onstage, doing it beautifully. And so this energy developed around the structure that we’d set in place and what we’d invited to happen. And that’s been characteristic of quite a few of the projects, notably those of Ei Arakawa, which generated amazing participatory situations, and Tania Bruguera, who, in collaboration with our gallery attendants, darkly manipulated the power dynamics of the space. It feels great to have a space, having programmed this kind of work in a somewhat parasitical manner around the core exhibitions and displays for ten years, and having to reinvent the format and situation each time. What we’ve seen in the Tanks hasn’t been allowed to happen at Tate before, because we could only program discrete events, or we had to specify the duration or the exact nature much more clearly in advance. Having a dedicated space means you can let things happen. It’s not so prescribed. So on one level it’s a status thing and it’s to do with designation of spaces in the museum, but it’s also giving a space to germinate this kind of practice that is central to how artists are working now, and connect back with such work in previous generations. I feel more and more that acknowledging this kind of work as a part of the museum feeds back the other way and makes me look at all the other objects in the collection through a performative lens. It has this viral energy. Having Tino Sehgal’s work in parallel in the Turbine Hall only puts added pressure on the conversation. Now that performance, if you want to call it that, is in, it’s changing things at the molecular structure of the institution. It’s challenging every level of how the museum operates. And that’s going to continue to be the case I think, especially now that we’ve got the Tanks. But also because of what we’re acquiring. We just had a research seminar about collecting performance. With any object you acquire in a museum collection—if you’re still defining a museum in terms of collecting—things aren’t completely stable, and they have to be maintained and preserved and treated. But performance has not been “tamed” by being accessioned and invited into the institution. It retains all these other “live” characteristics, whether it’s programmed or collected, which persist once they’re inside, pushing against how things work and how systems have settled into habit. I’m not saying this in a moral way or actually a judgmental way, it’s just a fact: Museums evolved around the culture of objects. The things artists have done since they’ve been here in the Tanks, they’ve just blown my mind in terms of the possibilities. You invite artists to do a project you have in mind, and then they do something a bit different. And there’s the excitement of it, though it’s often a bit alarming at the time! Aldo Tambellini, Black Zero, 1965. 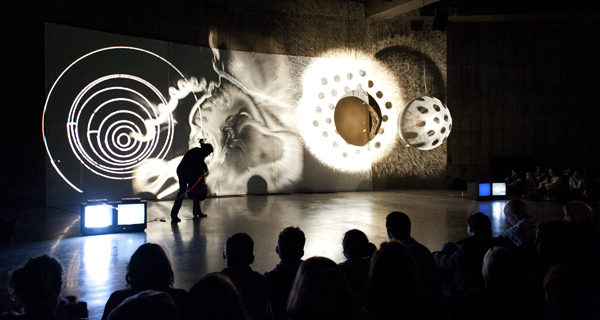 Performance view, Tate Modern Tanks, October 13 2012. Photo: Tate Photography/Gabrielle Fonseca Johnson. IT’S INTERESTING FOR ME to witness the actual reality of the audience experience in the Tate Tanks, how people are encountering the work. I remember seeing Trisha Brown at Documenta 12 five years ago and being intrigued by the questions raised by presenting live art in the gallery as an ongoing situation rather than a brief, ticketed performance. Tino Sehgal and others have also been broaching this question for several years, and it’s an important moment to consider how institutions are responding. The Tanks come down to a broad set of concerns that deal with process and not just the finished object. A lot of the works that we are presenting are essentially fugitive. How do you position such projects in a collecting, archival institution, which somehow is responsible for suggesting and questioning a canon? I think it’s a really interesting contrast given that Catherine Wood, Kathy Noble, and I were interested in not only this kind of work but in the histories of smaller, often artist-run spaces that originally presented it, places like the Kitchen or the ICA or the London Filmmakers’ Co-op. For us, it’s been interesting to contemplate how you might bring that model into a large institution, which ultimately has a very different agenda. This week we’re presenting the work of Aldo Tambellini. He’s one of the first artists to experiment with video, television, and multimedia performance, and he also helped conceive situations and spaces to present not only his own work but that of his peers. He started the Gate Theatre with his wife Elsa on Second Avenue and Tenth Street in 1966. It was one of the first cinemas in New York to have a devoted program of experimental films every night of the week, and Charles Ludlum’s Theatre of the Ridiculous occupied the space on weekends. It predates Anthology Film Archives and the Kitchen. Shortly after the Gate Theatre opened, he collaborated with Otto Piene to open a space upstairs called the Black Gate. The Black Gate became a crucible for performances by artists like Nam June Paik, Yayoi Kusama, and Jack Smith as well as Tambellini’s own “Electromedia” events. Aldo was experimenting early on with connections between cinema and performance as well as political activism, and he frequently collaborated with black poets from the magazine UMBRA, including Calvin Hernton and Ishmael Reed. He and Piene subsequently presented Black Gate Cologne in 1968, arguably the first work of art for broadcast television. Aldo helped to create a blueprint for many multidisciplinary institutions that came along later. 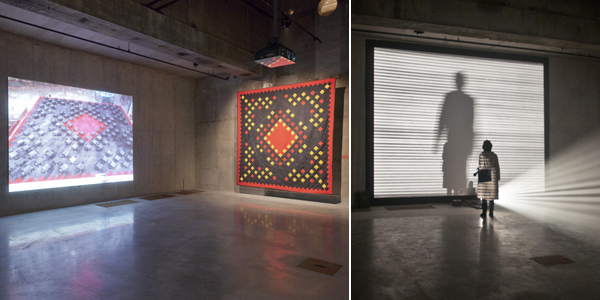 Left: Suzanne Lacy, The Crystal Quilt, 1985–87. Installation view. Right: Lis Rhodes, Light Music, 1975. Installation view. The relationship to time and to architecture and to one’s expectation of duration has definitely changed with the Tanks spaces and projects. Much of my portion of the program is very historical. We’re revisiting work primarily from the 1960s and ’70s. Many of those works, in their initial iteration, were done for audiences of maybe twenty people and were rarely written about outside of specialist publications. Now, we’re getting four hundred people for a Jeff Keen performance. What are the implications now that we’re opening this work up to a much larger audience? What are our responsibilities to that history and to the people experiencing it now? Obviously, it’s not the same work now as it was in 1973. Live art and experimental film practices are becoming of greater interest to emerging art historians. It seems to me there is a rise in the number of PhDs in these fields. These works traditionally have been recorded through a more anecdotal history. That’s interesting in the context of the Internet, and the fact that history is beginning to mean something else. I think everyone is now more critically aware of how histories are constructed, maybe a bit skeptical about canons in general. The role of a museum is changing, worldwide. It’s a moment when we’re expanding our collection along international lines—our ambitions have shifted to collecting work from non-Western parts of the world—but we also need to represent historical experiments and experiences that have not been properly valued or analyzed. We can’t rely exclusively on the usual stories anymore. The parallel history that this work offers prompts questions about these stories. That’s why we wanted to start with Suzanne Lacy and Lis Rhodes, to open the experience of the Tanks with recent acquisitions to Tate’s collection by women rooted in a feminist agenda in the ’70s and ’80s, who were asking tough questions about our history and its politics. I hope that their work continues to put pressure on curators, on artists, on audiences, and on historians to think more carefully about what the role of the museum should be and what sets of experiences the museum should be offering.